One of Your Golf Travel’s exclusive destinations, Cotswolds Hotel & Spa is one of the most popular golf hotels in the south of England. The course is a stunning parkland layout, flowing over undulating hills and tree-lined fairways, amidst the lush greenery of the Oxfordshire countryside. While the course only measures 6,316 yards, the changing elevation and narrow approaches provide a fair challenge, producing a layout that can be enjoyed by golfers of all abilities. Found on the outskirts of the Cotswolds Area of Oustanding Natural Beauty, just 40 minutes from Oxford, the Cotswolds Hotel is in a great central location and easily accessed from most of the UK. The hotel affords guests wonderful views of the surrounding golf course and countryside beyond, with spacious, contemporary rooms that are equipped with all the amenities one could need. The state of the art spa offers a range of treatments to help you achieve total relaxation after splitting the fairways. Book a Last Minute Deal at Cotswolds Hotel & Spa now from £99.00pp! The 499 yard, par 5, 11th hole is considered by many as the signature hole at Cotswolds Hotel and Spa. The hole offers a swooping, dog leg left shape, which requires an accurate tee shot down the hill to yield the opportunity of hitting the green in two shots for the longer hitter. The hole offers stunning, tree lined scenery and backdrops as you look both down towards the green and back up towards the tee once on the putting surface. The approach to the hole slopes gently from right to left, so emphasis on club selection is key to put yourself in a good scoring position. The narrow tree lined fairways weave their way through stunning views of the Cotswold’s, placing an emphasis on accuracy off the tee. The nature of the course is to take the onus off the big booming drive and instead challenge a player’s course management skills. The ‘River Glyme’ meanders close by and is the source of a couple of interesting water features on the front 9 holes. 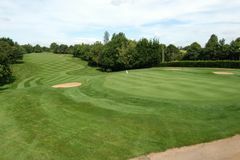 The course is maintained to a very high standard and occupies possibly the highest ground in the Cotswolds, drainage is excellent, which practically guarantees play all year round. We believe the best laid out course in Oxfordshire. We believe our stay & play offers exceptional value & we look forward to welcoming you. The hotel itself is surrounded by the beautiful golf course and rolling hills of the Cotswolds gifting guests with uncompromising views of the incredible scenery that surrounds them. All of the 34 rooms are newly built and extremely well equipped with a number of different modern amenities such as a flat screen TV and WiFi all of which are in place to make your stay as comfortable as possible. The hotel is also the perfect place for families as there are a number of interconnecting rooms on offer which means you are never too far away from your little ones. Also if you choose to have a room on the ground floor then they also come with a private terrace which overlooks the perfectly manicured fairways of the golf course and allows you to enjoy the fantastic views from the comfort of your own room. Furthermore, the hotel also boasts a brilliant state of the art Spa facility which is situated on the second floor and leads out onto the roof. Here guests are invited to enjoy some incredible treatments and enjoy this amazing pocket of tranquillity in what is a wonderful setting. The spa has treatment rooms and a steam room which provide the perfect place for you to pamper yourself. Following your relaxation sessions, you can retire to the rooftop which has panoramic views of the whole countryside. Lovely hotel...friendly staff...clean and comfortable room... Food very good, great portions. Very convenient to explore beautiful surroundings of the Cotswolds, and to enjoy the golf course. Not informed when booking about the building of new apartments adjoining the hotel, but this did not spoil our experience. Definitely stay again. The hotel was in a lovely location, we were upgraded to a suite overlooking the golf course which was beautiful. The rooms were modern, great decor, and facilities. The staff were very helpful and pleasant, and the food was reasonably priced. The spa was closed for the winter but that was ok with us as we were there to play golf. On entering our room we were pleasantly surprised to find our accomodation was spotlessley clean and very comfortable. There were tea/coffee available in room if needed. Our room overelooked the golf course which was a pleasent surprise. The staff were extremely helpful and made us feel so welcome. Clean,comfortable lovely setting. Staff very friendly and helpful. This is an excellent venue for a golf stay. Staff, food and rooms were great. Course is a good challenge, hopefully it will recover well from the hot summer weather. Excellent value for money golf break in a very good hotel with large and modern rooms. Walk in shower room was superb for 2 aching golfers. The 3 course meal in the evening was one of the best I’ve had in any hotel. Only downside was no proper decaf coffee and hot water boilers that were poor. Overall, I would thoroughly recommend. In general really pleased with the hotel, its modern,the room were clean the beds nice and comfortable. An added bonus was our room had a great view over the golf course. Would definitely recommend this hotel and hopefully return in the future. The Accommodation, food and facilities were good. The only criticism was concerning breakfast and the consistency of the messages given to me with reference to breakfast. On arrival at the club on Friday where we had some food before teeing off, we enquired about what time breakfast would be on the Saturday morning because we had a fairly early tee off time of 8.28am. We were told by the barman that breakfast was served from 7am, which of course would be ok. We played our afternoon round and then checked in. At check in we were advised that breakfast would be served on Saturday from 8am, to which I informed the check in staff that a) we had been advised by the barman earlier that it was from 7am and b) if it was 8am how on earth had the Club allocated us a 8.28 tee time which clearly would not give us enough time to have breakfast and be on the tee in time to play. The Check in person asked me who was the person that had told me 7am. I told him that I did not know his name. He said he would look into it and see what he could do. He called me when I was in my room circa 15 minutes;later and informed me that he had moved our tee times to 8.44 and 8.50am which was the best he could do. I thanked him. Later when we were ordering Dinner I spoke to the waiter that I still had a concern that we would not have enough time to have our breakfast in the morning and asked if we turned up at 7.50am could we have it 10 minutes earlier than the 8am start. He thought this would be ok and would leave a message for the Breakfast staff. We turned up at 7.50 and whilst we could help ourselves to coffee and cereal etc no hot food was available until 8.05am. At 8am I had to go and find out why the hot food was not on time. Whilst we had been given a slightly later tee off we still had to hurry our breakfasts. A pity because everything else was good. Would I recommend the Hotel and Golf? Yes, as long as they allocated any tee times at least an hour after breakfast is served. The hotel and food were excellent and the staff very helpful and friendly. The golf course was in very good condition and greens very fast.It is suitable for players of all handicaps and I would certainly recommend it.Thank you John Paul for all your help. Beautiful course ...some remodelling being completed but did not spoil our experience. Stunning scenery enjoyed... as well as really well kept greens. Green keepers very friendly..and happy to engage with us. Golf professional not so welcoming. Clearly course was being transformed in parts during our stay but still a great experience. Will definitely play again... well recommended. We enjoy playing on this course. We are beginners so the course was challenging with some interesting holes. Some of the signs to the tees had been removed so it took a bit of time to get our directions. Overall our golfing experience at the Cotswolds course was very good. Upon my arrival at the golf shop, I spoke to the pro to see if he could get me an earlier tee time and he was very obliging. He managed to team me up with three members and I shared the use of a buggy for the first round. The members were very friendly and made me very welcome. Giving me advice on each hole as we played. Great bunch of lads. The following morning the Pro again managed to team me up with three other members who were playing in club competition and this time we walked the course. The course along with the greens was in very good condition for December and this is a credit to the grounds staff. Some tough holes and back to back par 5's were interesting. Overall a good course and one in which I'd recommend playing. Lovely setting.Excellent greens. Some really attractive holes. Unfortunately the weather was wet for mid October and both rounds were hampered by heavy rain or drizzle. The greens were still in great condition and playable. The fairways had suffered from the hot, dry summer but were recovering. That said, it didn’t really affect the golf. 2 good days, enjoyed by all. It was easy to see that the hot summer had taken its toll on the fairways, but the greens were in good condition and many of them a fair challenge. The only complaint we had was that it's not that visitor friendly in respect of tee markers and directions to next tee box. We were a bit unlucky with the weather out first day was very windy, and the second day we was rained off so we couldn't get out on the course. The weather obviously no fault of the golf club.! Good course and a good test of Golf. Too many blind holes and not enough bells to ring to advise the group behind they can play. A – Yes you can. The hotel has a fantastic Spa facility on site which is the perfect place for people who do not play golf to spend their day. Q – Is there possibility of getting a buggy and do I need to reserve one in advance? A – The club has 12 golf buggies and these should be reserved when booking your tee time. Q – When is the best time of year to play Cotswolds Hotel & Spa? Q – How much does a 1 hour golf lesson cost at Cotswolds Hotel & Spa? A – A 1 hour lesson with academy coach Tadd Bainton would cost 25 GBP.